Iowans do things their own way – especially when it comes to politics. I know: I’m born and raised in Cedar Rapids, and am a first-generation freshman at Grinnell College, a liberal arts school in the center of the state whose progressive roots reach back to the Underground Railroad and the New Deal. But in recent years, Iowa has become a sea of red: our governor and all but one of our representatives in Congress are Republicans, who trade family farms for tax cuts to the wealthy. All too often, they’re anti-immigrant, anti-labor, and in the pocket of of big agriculture, the Koch brothers and other special interests. So together with fellow students, I’m taking Iowa back for progressives – one vote at a time, starting with my own. We’re going to elect officials who actually represent us and our true values. Here’s how. 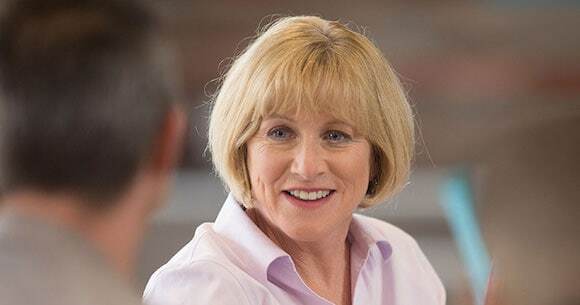 A lot changed for me in September, when I first met Cathy Glasson, the intensive-care nurse and union leader from Spencer who’s running for governor, when she spoke at Grinnell. I had just turned eighteen, and wanted to make sure my vote would count. When I started looking into candidates, Cathy stood out: her background and her progressive positions on the issues like single-payer healthcare and free college for all really caught my interest. I spoke with Cathy afterwards, and learned that she, like me, grew up in a working-class home and was the first woman in her family to attend college. She was unapologetically intelligent, strong, and assertive. Also like me, she was raised in an environment that stressed progressive values and advocating strongly for what you believe is right. She became, and still is, a role model for me. Cathy had my vote. But with all that’s gone on politically in Iowa, I knew Cathy would need more than my vote to win, so I joined Iowa Student Action and started to organize all across the state. More often than not, we were out in the snow. 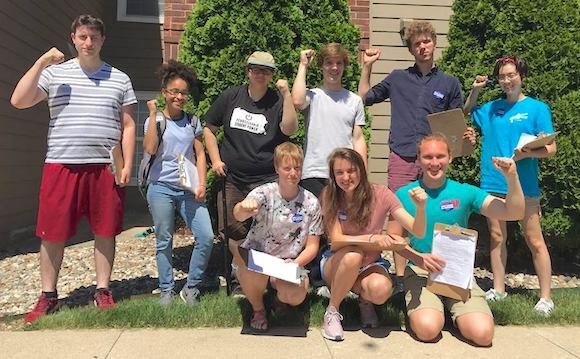 With other students from Grinnell, the University of Iowa and Iowa State, we knocked on hundreds of doors. In February, I went out in a blizzard to the Powshiek County Caucus. The news media pays a lot of attention to these caucuses, Iowa’s homegrown form of democracy, in presidential election years. Camera crews mob our high-school gymnasiums and town halls, hoping for a hint of where the country is heading. But Iowa holds these caucuses, which send delegates to county and state conventions, in every election. In many cases, showing up makes all the difference. 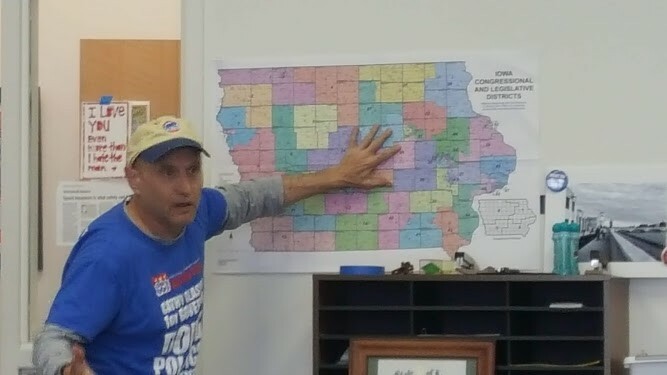 Along with Iowa Citizens for Community Improvement (CCI) Action, we organized in seven counties for Cathy – and won in every precinct where we organized. She won nearly fifty percent of these delegates – five times as many as her closest competitor, Fred Hubbell, a former insurance industry executive and heir to a family of wealthy Des Moines investors. In Powshiek County, I showed up with more than fifty Grinnell College students – much to the surprise of Powshiek’s old political hands – to cast our votes for Cathy. 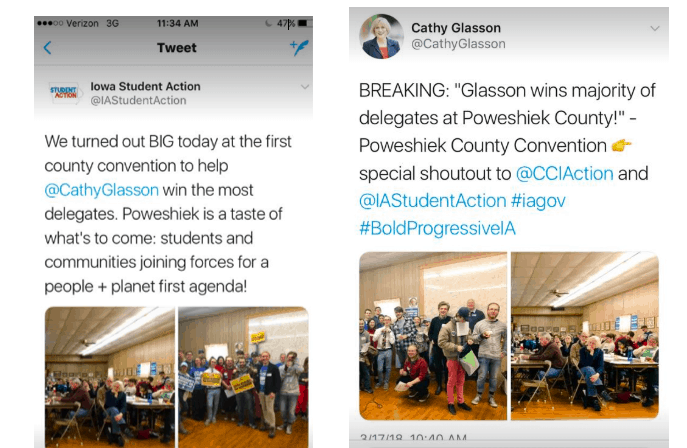 At the County Convention, inconveniently scheduled on the first day of our spring break, there was another blizzard whirling outside, but twenty of us from Grinnell showed up. We secured two state delegate positions for Cathy – out of a total of six, more than any other candidate – and I immediately raised my hand to volunteer to support the candidate I believe has really championed values that I hold important. Two weeks ago, I was able to cast my first-ever vote for Cathy at Grinnell’s student center, and I couldn’t be happier with my ballot. Cathy still faces an uphill climb. It’s a crowded field of Democratic candidates, even after one of the frontrunners unexpectedly dropped out. And if none of these gets more than 35 percent of the vote, all eyes will turn to our State Convention on June 16 to decide who will represent us in November. No matter what, I will be at the State Convention, along with my friends from Iowa Student Action and Iowa CCI Action, to cast our votes for Cathy – because she’s the candidate that best represents my – and Iowa’s – truly progressive values. And if she wins, I’ll cast my vote for her again in November. It’s been hard work, but this year has already taught me much more than I ever imagined about what real democracy looks and feels like. Working together, we can use community building to create and sustain a strong network of support for candidates with truly progressive values, like Cathy – on campus and beyond. Because this IS what democracy looks like. WE are what democracy looks like. So Washington, get ready! Progressive Iowa is back. Abby Frerick is a student at Grinnell College and organizer for Iowa Student Action.